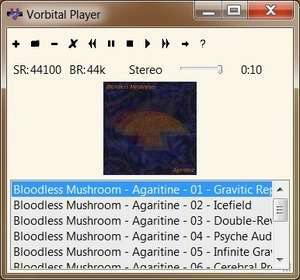 Vorbital Player is a free MP3, Ogg Vorbis, AIFF, SND, Wavpack, and Wave file player. It uses OpenAL and is small and compact in order to take up as little screen space as possible (though you can, of course, resize the window if you would like a larger playlist). It will also display the album art for a track if it is present. For security reasons, you should also check out the Vorbital Player download at LO4D.com which includes virus and malware tests. Additional screenshots of this application download may be available, too.